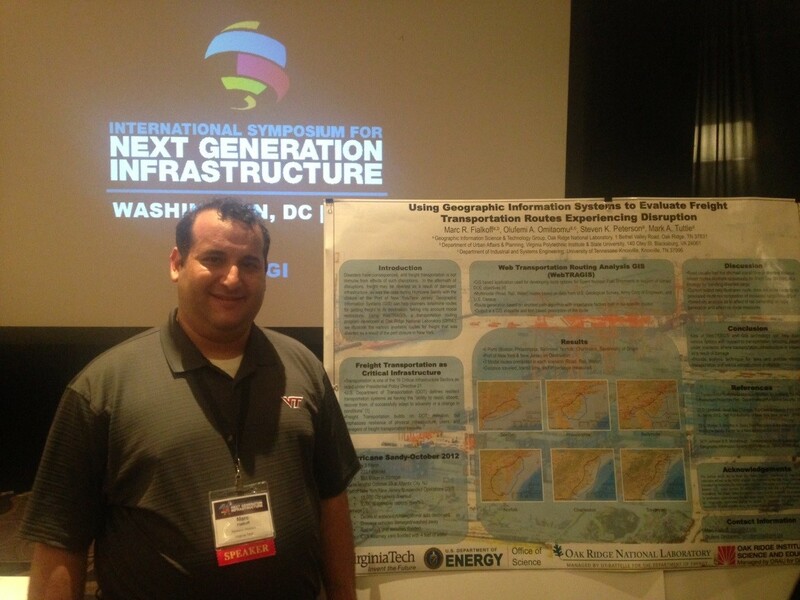 This past week, one of my PGG doctoral students, Marc Fialkoff, attended the International Symposium on Next Generation Infrastructure in Washington D.C. The conference brought together scholars from a variety of disciplines to discuss challenges in the areas of energy, transportation, water resources, and healthcare. The panel sessions focused on individual critical infrastructure sectors as well as techniques for modeling and implementing policies for more resilient infrastructure. Marc presented his work on freight transportation resilience and using GIS to evaluate legal restrictions on short sea shipping under disruptive conditions. This research was undertaken during his summer at Oak Ridge National Laboratory under guidance of Olufemi Omitaomu, the team lead for the Critical Infrastructure and Urban Resilience group at Oak Ridge National Lab. Marc’s research provides a good example of the interdisciplinary work that is undertaken by students in the PGG program at Virginia Tech. With training in law and transportation planning, Marc’s research bridges disciplines of law, planning, civil engineering, and network analysis to explore the impact of law and policy on the movement of goods under a time of crisis – e.g., during Hurricane Sandy. I co-chair Marc’s PhD committee with Ralph Buehler. Kathleen Hancock, Henning Mortveit, and Jonathan Gutoff also serve on Marc’s committee.